Independent importer, roaster, distributor, and retailer of premium coffee products, Jumping Bean Coffee is growing into one of Canada’s largest Canadian coffee companies. Their focus on producing socially and environmentally responsible products is setting them apart from their competition. Jeff LeDrew started Jumping Bean Coffee company as most entrepreneurs do—out of his house. Prior to starting what is now one of Canada’s largest independent coffee companies, LeDrew was working as an electrical engineer for a telecommunications firm. As a lover of high-end coffee, LeDrew took an interest in roasting his own beans for his coffee breaks. Not only was the process of roasting enjoyable, and the smell and taste of the coffee second-to-none, but discovering the environmental and social impacts of sourcing the beans from a fair trade, organic supplier proved to be eye opening for the budding entrepreneur. When the St. John’s, NL Rotary Club, of which LeDrew is a proud member, started looking for fundraising ideas for the Brighter Futures Coalition of St. John’s and District, it was proposed that LeDrew’s coffee would be a great fit. It was through this endeavour that Rotary Roast was born. From here, Jumping Bean leapt out of the home business and started to blossom. Customers loved Jumping Bean Coffee and the fact that is was roasted, packaged and shipped from Newfoundland. 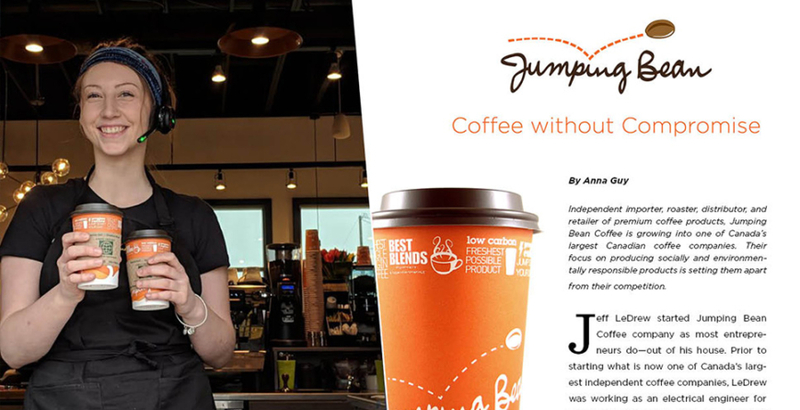 Between 2005 and 2012, Jumping Bean went from selling locally in independent stores, to distribution throughout Atlantic Canada in stores like Sobeys, Co-Op, Walmart, Amazon, and Costco. 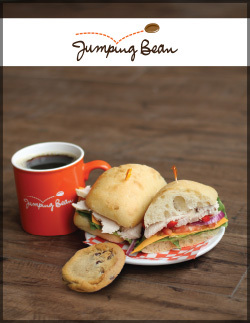 In 2013, Jumping Bean gained national exposure through a Canadian distribution deal with Target Canada. Cafés began opening in business offices, and then stand-alone cafés started to open, to a great reception. Corporate revenue has grown from about $7,500 in its first year to now close to $10 million annually. Jumping Bean was built on the Rotarian motto of “Service Before Self”, and has followed this motto in every aspect of the supply chain, from roasting through to customer service. “It’s a simple but powerful philosophy,” LeDrew says. Additionally, Jumping Bean’s commitment to the environment is ingrained in every level of the business. For example, the company modified its roasting process to a method that produces 85 percent less CO2 emissions. “This means that for every pound of ECO2Roast coffee we produce, you save the world about 1lb of carbon waste,” LeDrew says. The company also poured its resources into developing and launching BPI Certified, 100 percent compostable single serve pods that speak to the company’s commitment to environmental responsibility. As one of the largest fully Canadian-owned coffee companies in the market, LeDrew says the company’s primary focus is solidifying a national brand with its products in grocery and retail outlets across Canada, and targeting the market in the United States, possibly introducing its line of Ready-to-Drink (RTD) Coffee there. This new RTD product line features Cold Brew Coffee in bottles and Nitro infused Cold Brew in cans. “This new ready-to-drink product line opens a new channel for consumers to taste our coffee and will allow the Jumping Bean Coffee brand to grow on both a national and international level,” LeDrew says.